• The majority of your cycling training should be aerobically based, as this is where you will spend more than 90% of your ride. Some interval sessions or time trials that get the heart rate into the anaerobic zone for periods of 5 -20 minutes. This will further help your body cope with the strenuous swim to bike transition as this is where the heart rate is at its highest. If your body is able to cope with this higher than normal intensity for 20 minutes, it gives you enough time to settle down after the swim and bring your heart rate back down. • Comfort on the bike is extremely important. Your setup can be as aerodynamic as you like, but if you can’t stay in that position for the majority of the 180km, it’s worthless. Try to do the majority of your cycling in the aero position, so that you get used to this position. My advice is to visit a reputable Tri-shop to help you with a more comfortable and more aerodynamic bike fit. • Sticking to a slower, more controlled cadence can save a lot of energy and will keep your heart rate lower for the longest discipline of the race. Many people want to ride like cyclists at 100rpm, but remember, they don’t have to run afterwards, and they also spend countless more hours on their bikes refining this skill. As triathletes, you are better off trying to ride at a cadence that closely simulates your running cadence, for the average person that would be between 80 - 90rpm, and for stronger cyclists even lower. Having said that, your muscles need to be conditioned to pushing the bigger gears at a slower RPM, so the correct training and preparation comes into play again. Riding hills in a big gear and trying to improve your torque will help increase your power and ultimately your bike splits. • Have a nutrition plan that you can stick to. The bike leg is the only time you’ll be able to get real nutrition in, as it’s a lot harder to “eat” anything on the run. Have some solid foods with you, but try to consume them in the first 120km. The longer the race goes on, the less you’ll feel like eating, as the heart is pumping all the blood to your working limbs. Eating solid foods requires the stomach to draw blood to the stomach, so digestion becomes difficult, and that’s when gels become crucial. 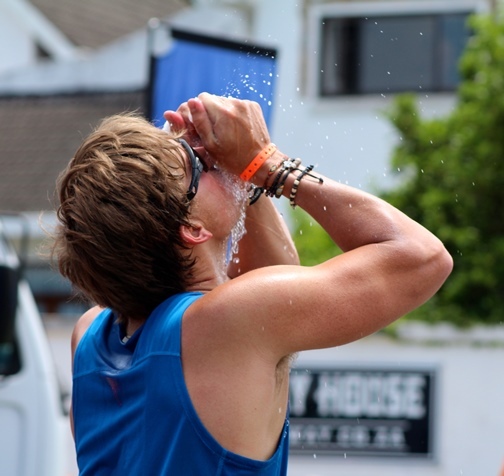 I hope these tips are beneficial for your training and prepare you for the Standard Bank IRONMAN® triathlons; and remember to Never Stop Moving Forward in your training.